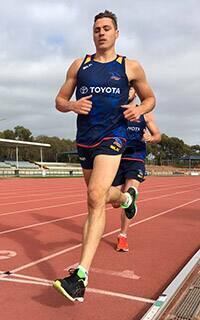 FRINGE Adelaide defender Jake Kelly has upstaged the club's senior players to take out the 2km time trial on Monday. The entire Crows squad trained together for the first time at Football Park since their semi-final loss to Sydney at the SCG. Kelly couldn't force his way into the Crows side this year after playing 10 games in 2015. The 21-year-old finished ahead of wingers Rory Atkins and David Mackay, defenders Brodie Smith and Rory Laird and reigning club champion Rory Sloane in the first group. Midfielder Riley Knight, who took the honours in the last time trial when the club's first-to-fourth-year players returned to training two weeks ago, wasn't required to run. Rookie-listed forward/ruck Paul Hunter was the fastest in the second group ahead of veteran midfielder Scott Thompson and defenders Andy Otten and Daniel Talia. Talia (adductor) and Jake Lever (ankle) ran well after having end of season surgery after the loss to the Swans.